Forgot Windows 10 user password? The first thing a normal user tries to do a fresh re-installation of Windows or take the PC to a repair shop. 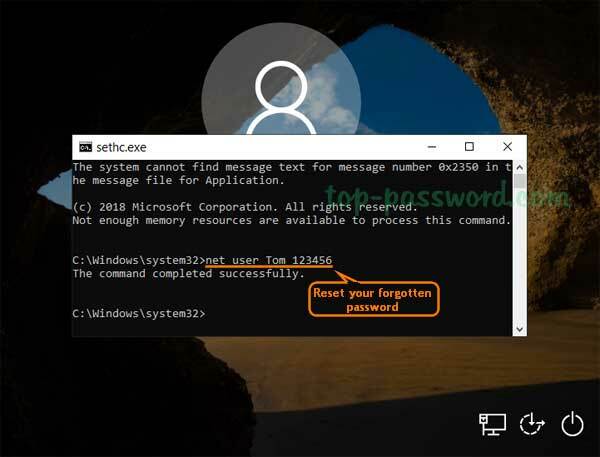 There’s lots of softwares to reset a forgotten password, but here we’ll show you a simple hack to reset forgotten Windows 10 password using the sticky keys method. How Does This Hacking Method Work? 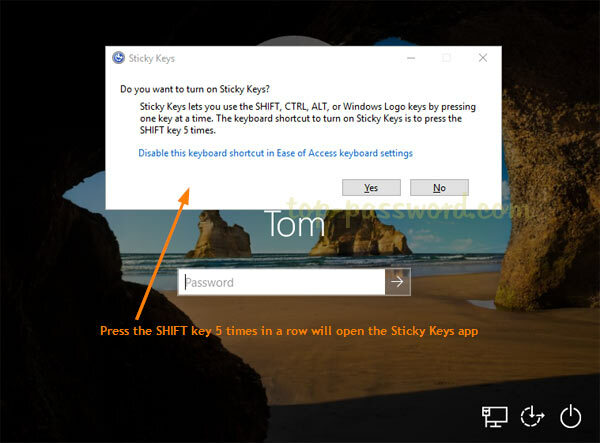 Sticky Keys is part of Windows Ease of Access features that allows a user to tap the Shift, Ctrl, Alt or Windows key once to achieve the same effect as holding the key down. If you press the SHIFT key 5 times in a row at Windows login screen, the Sticky Keys application (sethc.exe) will launch and ask if you want to enable sticky keys feature. 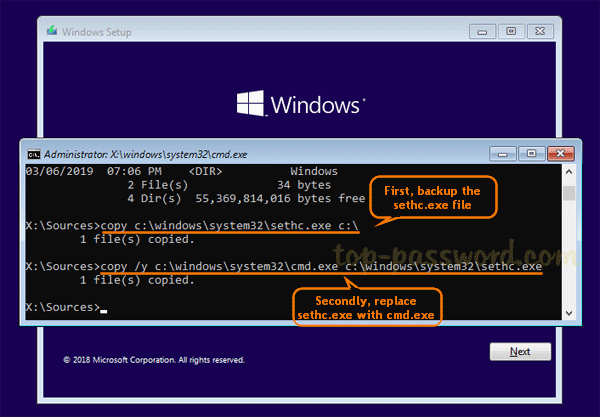 This hacking method works by replacing the sethc.exe file with cmd.exe. When you boots to Windows login screen, pressing the SHIFT keys 5 times will launch an elevated Command Prompt. From the Command Prompt, you have sufficient privileges to reset a lost password without knowing your current password. This method works flawlessly with all versions of Windows XP, Vista, 7, 8, 8.1 and 10. 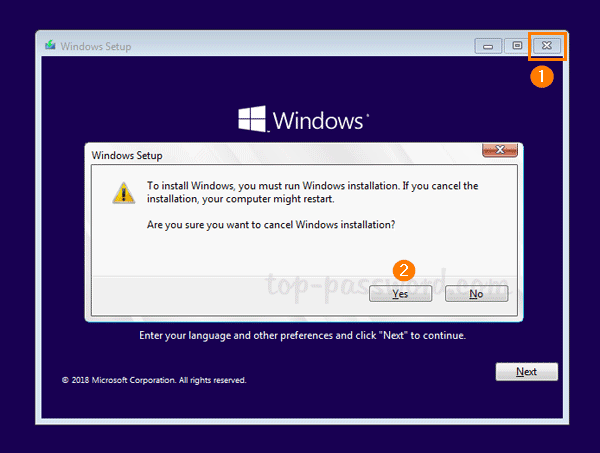 Boot your locked computer using your Windows 10 installation DVD. If your computer doesn’t boot from it, you might need to change the boot order and disable UEFI secure boot. After loading the installation files from the DVD, you’ll be shown the language setup screen. Just press SHIFT + F10 key combinations to launch the Command Prompt. Use the dir command to find the drive where your Windows was installed. Note that the drive letter for your Windows partition could be D:\ or other as C:\ might be assigned to the System Reserved partition after booting into a Live CD. Enter the following two commands one by one, press Enter after each. Replace c:\ with the correct drive letter if Windows is not mounted on c:. The first command backs up the sethc.exe file, and the second replaces it with the cmd.exe. 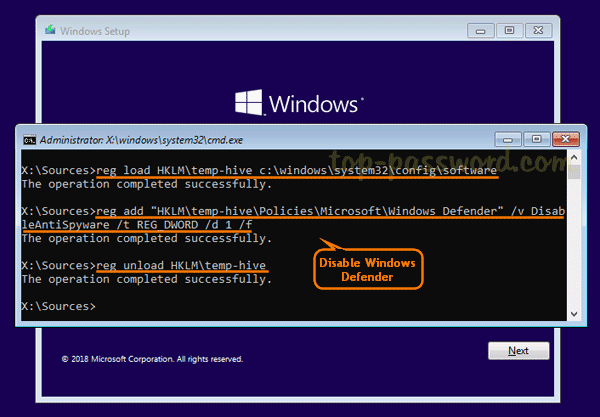 Next, run the following commands to disable Windows Defender as it may detect the sticky keys trick as a security alert called “Win32/AccessibilityEscalation“. Now close everything and cancel Windows Setup. Remove the installation disc and reboot. Once you get back to Windows 10 login screen, press the SHIFT key 5 times in a row, it will open the Command Prompt in administrator mode. Enter the following command to reset your lost Windows 10 password. Substitute the name of the account to reset and a new password as appropriate. If you don’t know your account name, just type net user to list the available user names. Close the Command Prompt and you can now login with your new password. After logging in, remember to restore the sethc.exe file we overwrote in step 4, and turn on Windows Defender real-time protection. Enjoy! This sticky keys method is quite well known and could be used to break into any Windows-based computer as long as you have physical access. So you might ask how can I prevent someone from hacking my Windows password? Just set a BIOS password to lock the boot sequence so others can’t boot from CD/USB. To make password recovery easier than even before, we’ve developed a software for both beginners and advanced users – PCUnlocker, which allows you to reset a forgotten Windows password or create a new admin account to access your locked PC. Forgot Windows 10 password on your Acer Aspire Switch laptop and have no idea how to reset it? How to bypass the password login screen without formatting your hard drive? 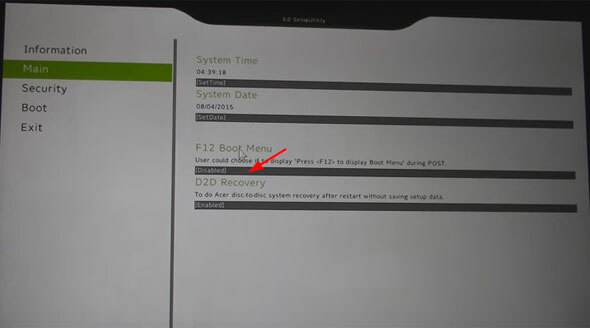 The Acer Aspire is a secure boot system based on the the latest UEFI BIOS. In this tutorial we’ll explain how to create a UEFI compatible USB drive and boot off it to reset Windows 10 lost password on Acer Aspire Switch laptop. Download the utility PCUnlocker Enterprise and save it to your local hard drive. 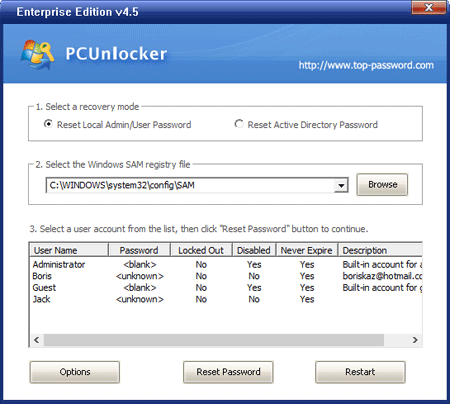 PCUnlocker Enterprise comes in two architectures: 32-bit and 64-bit. If your Acer Switch laptop comes with Windows 10 32-bit, please use the 32-bit version of PCUnlocker Enterprise. Otherwise you have to use 64-bit version correspondingly. The downloaded file comes as a .zip file. Decompress it and you’ll see two files: pcunlocker.iso and ReadMe.txt. Use the freeware ISO2Disc to burn the pcunlocker.iso file to your USB drive. Make sure you choose the “GPT (required for UEFI boot)” option as ISO2Disc will partition your USB drive with GPT partition table. Use an OTG USB adapter to connect the USB drive to your Acer Aspire Switch laptop. When it’s powered off, press and hold the Volume Up button, then press the Power button. Release both when the laptop starts. Now you’re in the BIOS menu. Another way to access the BIOS is repeatedly press the F2 key when powering on the machine. Once in the BIOS, select the Main tab. click on “F12 Boot Menu” to set it to Enabled. 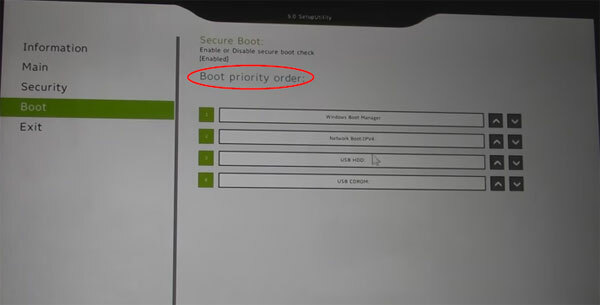 Switch to the Boot tab, rearrange the boot priority order and set USB HDD as the first boot media. Save your changes and exit. Now the computer will reboot from your plugged USB drive. After loading, the PCUnlocker program will launch and you can see a list of Windows accounts for your system. Choose a local account and click on Reset Password. 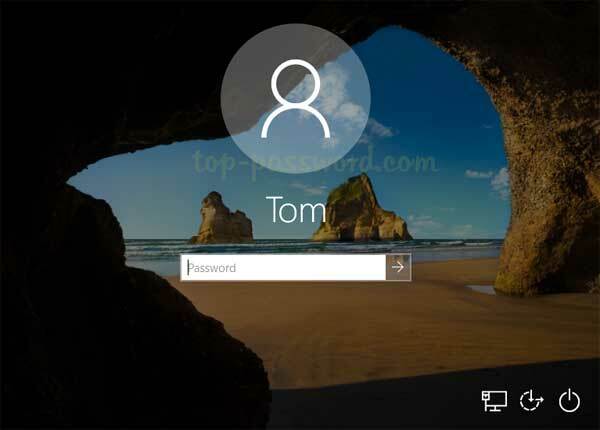 It will quickly unlock / remove your forgotten Windows 10 user password. If the local account is linked to your Microsoft account, the program will automatically switch your login back to local account so next time you can log in to Windows 10 without a password! You can also use this method to reset lost Windows 10 or 8 password on the other brands of computers running with UEFI secure boot.